I look at it as a broad spectrum. It is a production of design that has not exploited the worker or does not exploit the self-esteem of the wearer or the buyer by portraying unachievable body ideals. There is a full circle to sustainability, it’s not just resourcing, it’s a motion. How have you considered or communicated sustainable fashion in your own career? I have had a very long career, and for me I was always interested in identity. Right at the beginning, when I began at i-D magazine it was about being able to say something about yourself, being able to self-style and control your image and being able to feel good about yourself and your body. That has always been what drives me. I saw a massive change in the 90s when big brands were gobbling up the smaller labels. These corporations were beginning to effectively convince consumers that they needed to buy more and more by reducing prices. To enable this, suppliers’ prices were squeezed, resulting in large profits for the brands but poor wages for the workers. Furthermore, they would promote imagery of women that is objectifying and unachievable in its promotion of one body ideal and then come digital, benefit from accelerating that promotion. My career has been very much about broadcasting a counter cultural transition and naming myself as a disruptive fashion lover, critiquing the way the big businesses are working and being excited about innovative solutions from emerging creatives. Did your visit to Dhaka, Bangladesh challenge your values and practices? 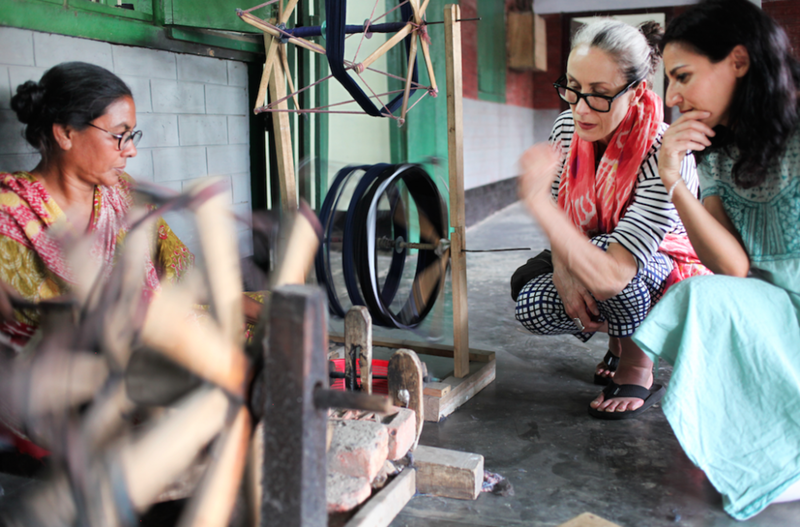 I went to Bangladesh with Safia Minney who is the co-founder of People Tree to do two things. I went to hear a testimony from workers who had escaped the Rana Plaza disaster and to hear directly from them what had led up to their situation and how they had been treated afterwards. Many families lost the wage earners and the grandparents, were left struggling to look after the children. The situation is dire out there, because people aren’t even paid a living wage so they need two or three wages to support a small family and they often all live in one room. Compensation was promised by western companies and not delivered. Prior to the incident, I was told that workers had flagged up concerns about the growing cracks in the walls but were repeatedly ignored and threatened, in such unethical ways as the withholding of their wages if they didn’t complete jobs. This indicates a system that is too big to manage itself, too big for the people who say they care about these things to check what’s actually happening. If we had smaller businesses and smaller systems and there was less profit margin and less bonuses going to CEO’s, we might have a system that was easier to monitor. There is nothing more powerful than seeing something first hand, you never forget it. Regularly I was so emotionally impacted, that it was burnt into my brain. During your trip, I understand you visited the workers at People Tree, how did that experience differ from speaking to the survivors of the Rana Plaza? I travelled with Safia, inland from Dhaka to a village called Thanapara, where People Tree clothing is made. It’s a fair trade complex in which I could compare the lifestyles of the workers effectively. I witnessed a huge difference, there was simply no human suffering, everybody was joyful and felt they were engaged in a day’s work that made them feel good about themselves. They took a wage home to their family and they weren’t working exploitative long hours in industrial situations that were dangerous to their health. Really interestingly, I met one worker who had escaped the Rana Plaza and gone to Thanapara who stated ‘I never ever saw my daughters when I worked in Dhaka because of my hours. I had terrible health because of the water supply and the food that we were able to afford.’ This woman was speaking from a village mud hut with a shared village toilet, however, she was thrilled about the rise in the standard of her living. How have these experiences affected your personal consumption of fashion? It is difficult for people to really understand the impact our clothes have on people’s lives and the very poor treatment of workers who make them. Since I began thinking hard about it, I have bought my clothes very differently. I don’t buy from high street companies, but I will buy high street in a second hand shop. I investigate clothes for cut and design features that are flattering for me and I’ll buy from sample sales of young designers or if something has been made by a seamstress. I also like to buy from recycling or upcycling specialists or designers. Quite a lot of garments that I own have had a different life and they have been remade into something else. How much impact do you believe a young designer has in changing the future practice of the fashion industry and what advice would you give? I think a young designer can have great impact on many levels. In the first instance, being part of a creative team in a big firm, asking questions and investing process crucial. When something doesn’t feel right, being able to say ‘could you just tell me where we are getting this particular fabric from? Is there any way we can improve our relationship with the people who supply us?’ Asking questions empowers other people to investigate their own thinking. Looking forward, have aims that are not unreasonable so that you can gently navigate through, but be open to opportunities that come up. If you are looking to start up your own business or make your own product then a key thing to do would be to engage with people who are just that bit further ahead of you - contact people who could be mentors and ask them questions. Interning is a really valuable way of learning because it’s a fair exchange. However, it never ceases to surprise me when interns don’t ask questions. They may have taken part in some business process but they have missed out on 75% of the intern treasure, which is asking questions. Create your definition of success. My definition of success is being able to work on projects that don’t compromise my values and at the end of each day I’ve made a contribution to the self-esteem of people who may come into contact with what I am doing. However, that has meant that I don’t always have a secure earning stream or that I’ve turned down work that’s been quite a bit of money because I know I won’t feel good about what I’m going to be asked to do. High status jobs potentially do offer high status finance but they also bring with them extreme pressures and sacrifices. For some people, doing those jobs for a short while is a very valuable learning experience, which then nourishes how they want to go forward. Finally, for all beginners to know, every single creative professional has doubts, moments where their own confidence has been challenged or ideas didn’t work. Of course you grow in confidence as you go forward but nobody is indestructible, every creative feels insecurity and needs to tap into a certain level of bravery. Everyone puts out calls and emails and doesn’t get replies and it’s very tempting to think that it’s you because you’re not talented enough, but that’s just how it is. Developing resilience is something that we all need to step up to so we can remain in the game.